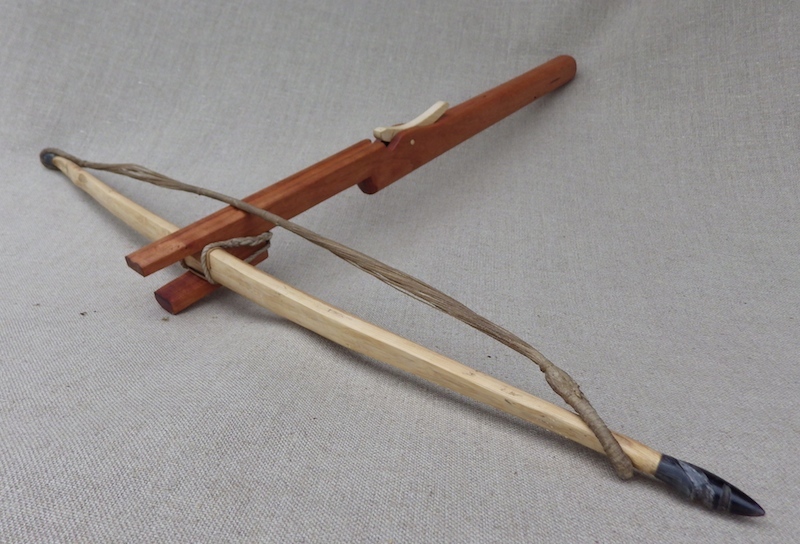 Here are two crossbows with yew bows. I was looking for information last year about early bows. 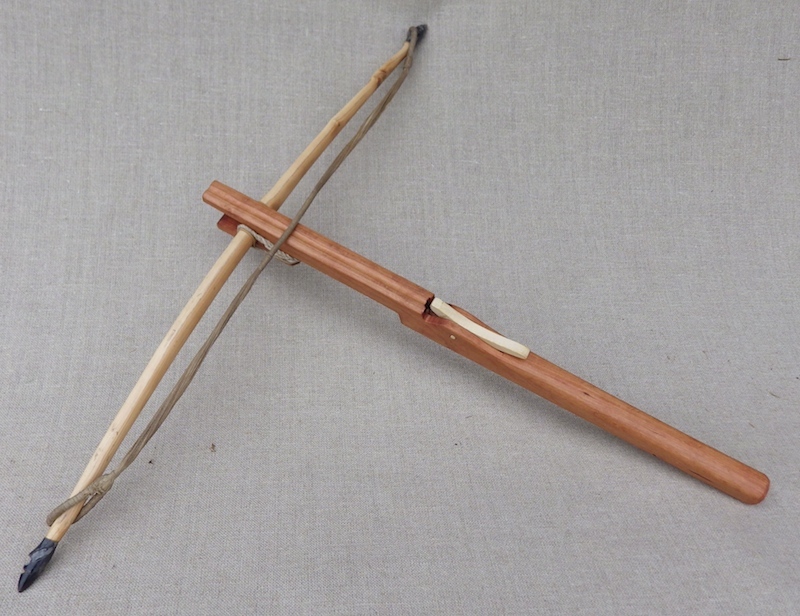 The first of these I just fancied making, the second is supposed to represent a bow from around the year 1150/1200 and where most makers seem to make rising peg bows for this date I was not convinced this was the way to go and so sought help here to galvanise my opinion....this is the result. The first is based on the find from Colletière à Charavines and is most likely a hunting bow. 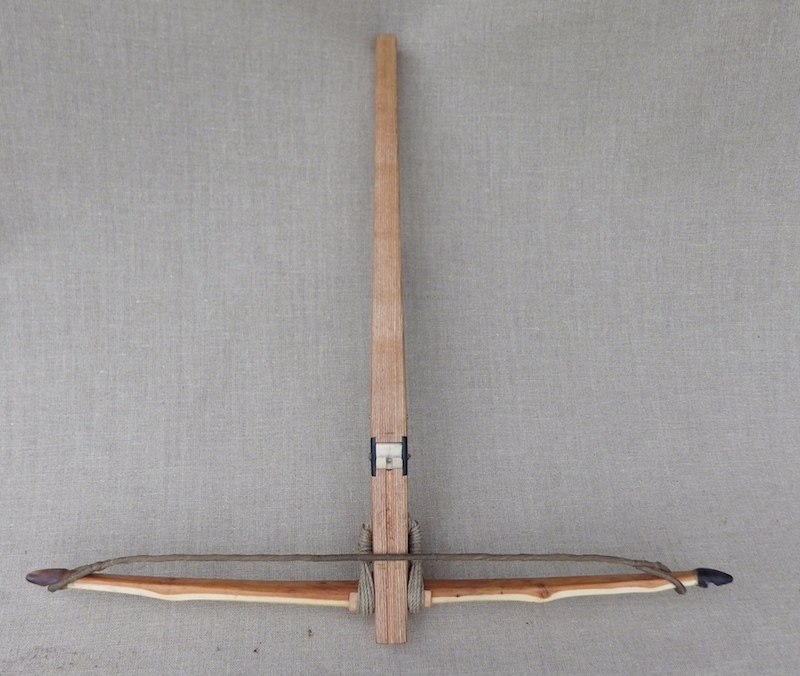 I wanted to make this because the first bow I tillered came in well under weight and so it needed a home and I liked the simplicity of this bow and this was the result. 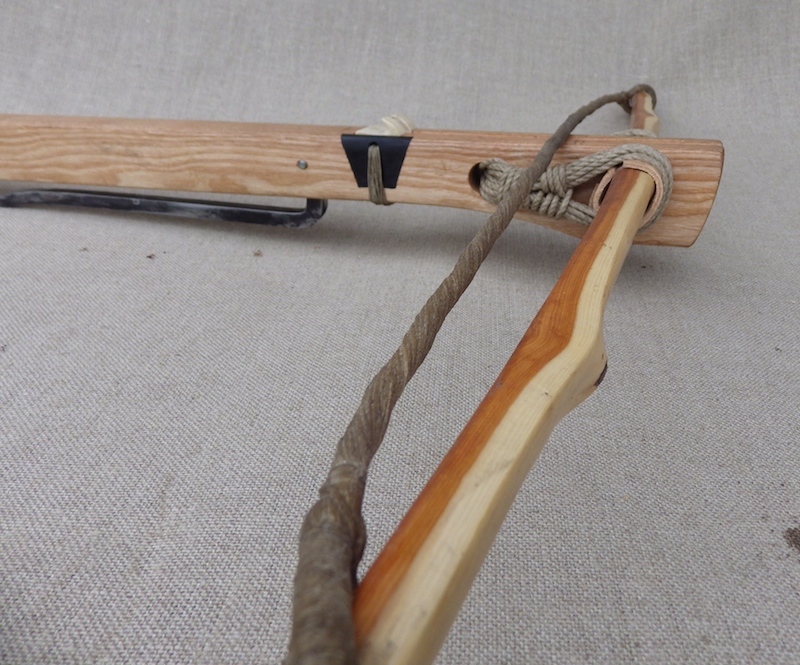 Basically it is a very easy bow to make and the trigger is very simple and effective. It holds well and releases without too much load required. I used seasoned wood for the stock, but in green wood, a scraper, saw and drawknife would be all you would need. 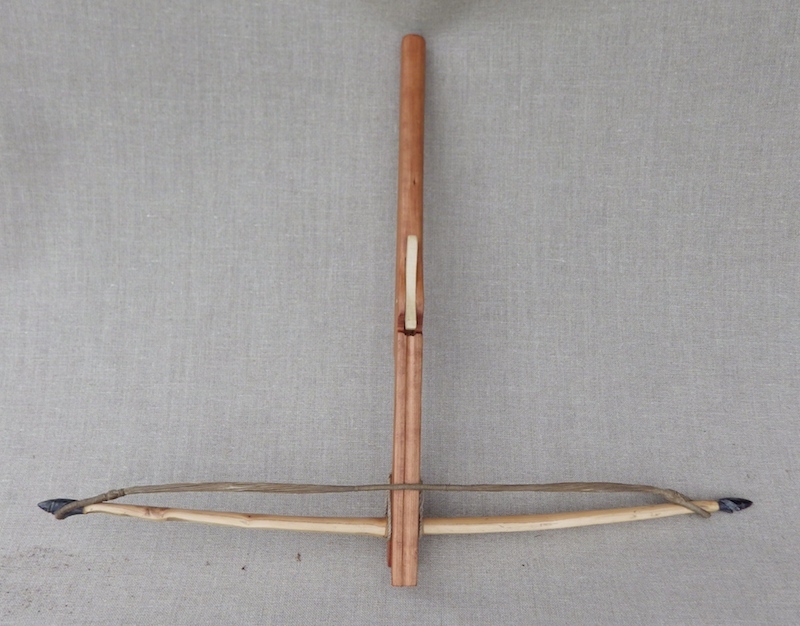 The bow of course is much harder to make and needs all the usual tillering that a yew bow needs and again the string I made in the usual crossbow way, but as you need a fat string and the poundage is light, in retrospect the string could be made like a longbow string and the bow would not need nocks. Anyway I like it, both to make and shoot. The second bow is based on manuscript sources as there are no (to my knowledge) surviving bows from this period. 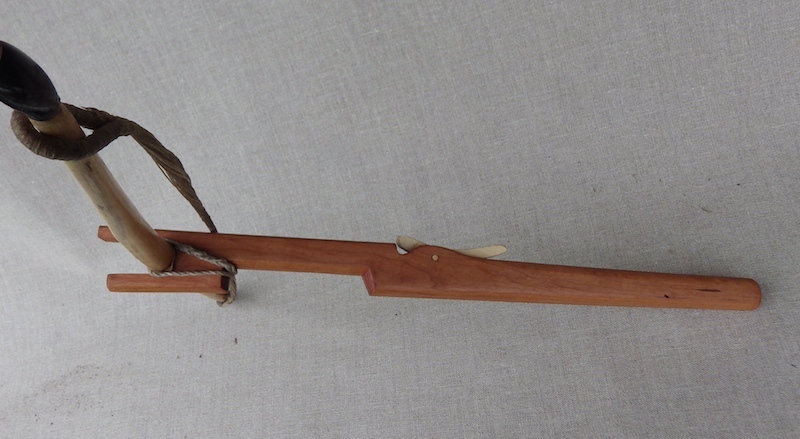 The stock is ash, the bow is Italian yew and tillered to 140lbs and lashed on with hemp. 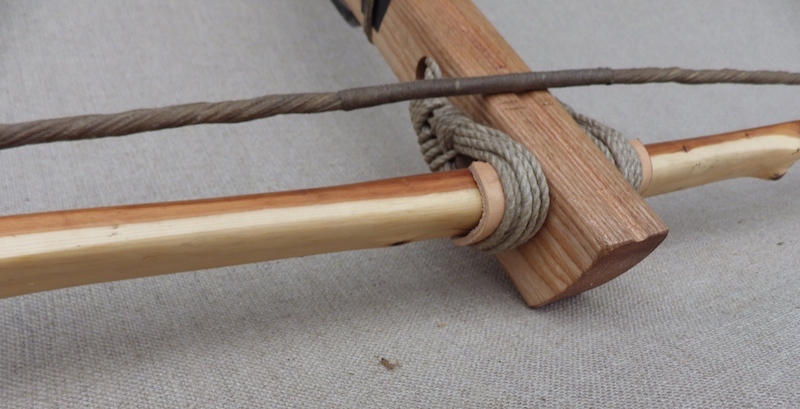 The nut is antler and also lashed in place with hemp. I reinforced the cheeks with horn, but stuck to a simple form. This may be contentious, but I suspect even if it was not the norm it would have been done. The trigger is a long simple and straight form. Noticeably, the bow does not have a stirrup; these seem to come in around 1200 and so as this bow was dated a little before this I decided not to fit a stirrup. The bow is spanned by putting a foot either side of the bow whilst sitting on your bum, or using a foot on one side. Stringing the bow was of course a headache and in the end I adapted a car jack to fit on the stock; back in the day it could be done with two strong men, but to save everyones back, I went down this route. It is a little hair-raising tillering a short bow to that weight, but otherwise the manufacture was fine. It started life as a considerably longer bow and so needed to be shortened and retillered extensively, but what I particularly love is the very lumpy appearance of the back - just like the artwork. They show an elegant simplicity of design and function. So the first bow is a hunting bow and the second is a military bow? Leo, these look very interesting and I assume that even if they where not more powerful than a hand held bow they still have the advantages of any crossbow in being able to be loaded and aimed for an extended time went hunting or for ambush or for shooting from behind cover. The shorter power stroke might actually make them weaker than a hand held bow of the same draw weight but more than enough for hunting or shooting at unarmoured or lightly armoured enemies, I'm assuming. Love the knotty bow, as there are all sorts of depictions of them into the 13th century. Jean has it exactly correct. The numbers sound powerful, but the reality is that with the short power stroke, these are relatively moderately powered bows but they do have advantages, again as Jean says. Still they are fun to shoot. 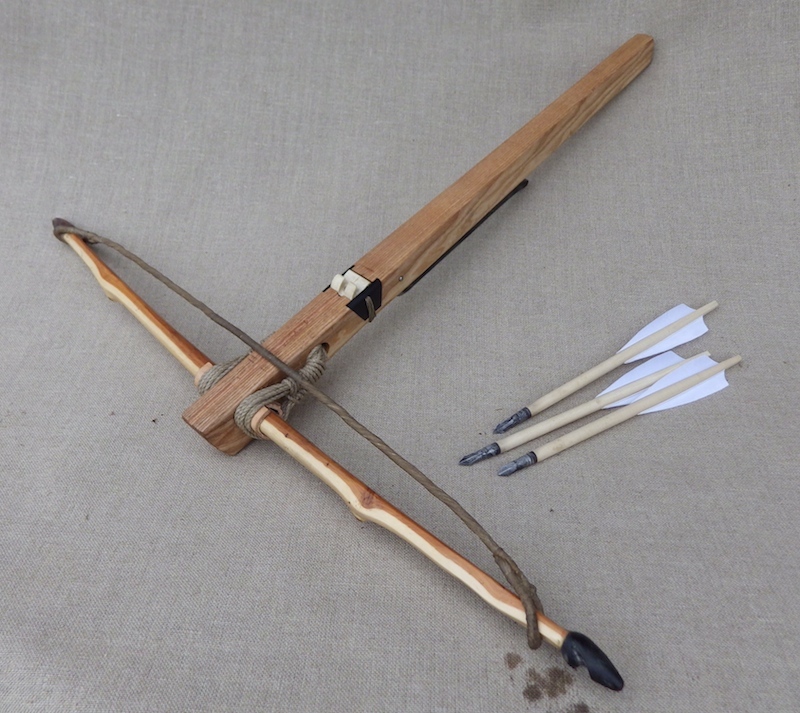 This chapter is not closed though, as I have not tillered bows for a few years and I got the bug again, so I may make a few more wooden bow crossbows in the future. 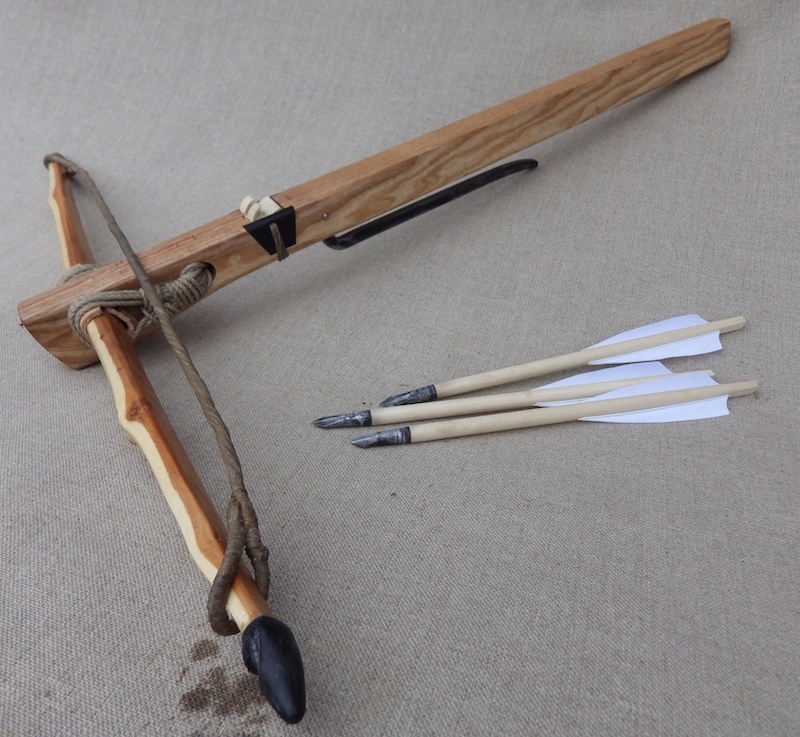 I may try a simple ash version of the Colletieres with a longer stroke and see what happens. If I remember my history correctly, Byzantine princess Anna Comnena, in her history The Alexiade, described the spanning of such a bow during the First Crusade, by the Frankish bowman laying on his back, bracing the bow by both feet, and pulling the string to the mark. Your handmade crossbows are quite excellent, Leo. And, by the way, have you tested both yet? I love them both and especially the second one. Do you have any visual sources showing the horn tips?